"One way to win the game is by making up at least part of the rules, something the rich do." RIO DE JANEIRO, BRAZIL -- The sun was going down and the wide boulevard Rua Rio Branco was jam-full of screaming humanity backed up with banging drums and all sorts of waving signs and banners. It was a large unruly demonstration on the 1st of April recognizing the 50 year anniversary of the 1964 coup that led to over 20 years of brutal military rule in Brazil. The anniversary has been discussed in newspapers and in various forums in Rio leading up to this date. Remembering the coup has become all wrapped up with the controversy over urban renewal efforts and costly construction projects associated with the June World Cup matches and the 2016 Olympics. Many in Brazil would prefer resources be used to improve education, medical care, transportation and other infrastructure areas. 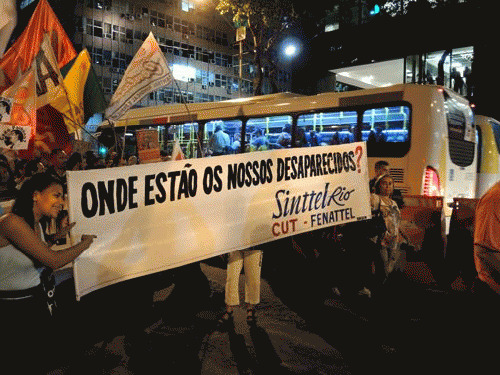 It's an eternal political struggle, especially in a place like Brazil, between the top and the bottom of society. Cinelandia Plaza is the site of a famous cinema theater known as The Odean, which on April 1st was running a series of Brazilian films focused on the culture's African roots. The Plaza is surrounded by open-air restaurants and impressive buildings. When the moving mass of pissed-off humanity reached the Plaza, darkness had fallen and the dynamic became a cat-and-mouse game between cops from the Policia Militar dressed like Darth Vader's raiders and a rambunctious assemblage of youth, many with gas masks and willing to taunt the highly disciplined cops. Someone powerful had clearly made it known to these cops that there would be no "incidents" this night -- or else. For instance, the well-protected cops received a few large rocks lobbed into their huddled midst without any kind of retaliation. The craziness started when someone threw red paint onto the entrance of the Clube Militar on Rua Floriana. A good ol' boy military club was certainly the best symbolic target around. This was followed by two loud booms and a wild scattering of humanity and an annoying trace of tear gas wafting in the wind. The Plaza soon turned into an edgy carnival out of a Fellini movie. A tall guy dressed up like Batman and an inspired lunatic in a dress with a pirate hat and a raccoon mask danced and pranced around while two guys played trombones that sounded like drunken circus music. This had spontaneously arisen after three young men were run down and encircled by a scrum of plastic-armored cops about 20 feet away. While the cops searched their young captives protected by the scrum, the lunacy ruled. Among the rich, the powerful and Brazilian militarists, the coup is known affectionately as "the revolution." It was for the good of society. A cleansing was needed, and patriots rose to the occasion. In one of the great Brazilian writer Rubem Fonseca's recent stories he features a rich plantation owner and senator noted for his "services rendered to the revolution." Fonseca provides an interesting window into the Brazilian soul. Before taking up fiction, he had a career as a police commissioner. His stories paint a picture of Brazil as an anarchic, Catholic society where crime is more of a spiritual condition than a legal concept. It's a world where being with the police has little to do with morality or justice and more to do with protecting those in power and those with wealth. Basically, it's a thoroughly corrupt world. The waiter in the Fonseca story quoted above in the epigram talks about the rich making up the rules, which is pretty much what a military coup and violent government can be reduced to. In the mind of Fonseca's poor protagonist -- and I would submit in the minds of many Brazilians -- winning and not losing is an issue much more important than following anyone's rules. In the protagonist's case, he trains and disciplines himself and lands a high-end waiter job because he wants to kill a very rich man. His resentment is so deep and twisted he feels such an act will make him feel like a winner. He bides his time doing an excellent job until the perfect rich customer comes in and he cleverly poisons him. Since he's poor and a non-entity in the cops' minds, he's not even suspected. He's interviewed and thoughtlessly dismissed. As he leaves the station, he mutters to himself, "My yacht was bigger than his." My colleague and I learned a little about Brazilian crime when the equivalent of modern highwaymen employed a cash machine at the airport to strip our bank accounts. Late at night when no one's around these clever rogues open the machines and re-insert a card-reading device that both allows the transaction to proceed as it records one's banking information from the card's strip and your pin number. In my case, I used the card on March 18th and five days later on the 23rd someone 200 miles away in Sao Paulo began to strip the account of funds. Before my bank shut off the card, they got $1,500. They got more from my colleague's account. That day, they were the "winners." A Google search led me to a one-year-old story on the very same airport machines  that fleeced us. When I reported the crime to the Rio Tourist Police, a lovely young woman who spoke perfect English handled my case. We both knew nothing would be done and her job was to make the obligatory report for my bank fraud claim. We talked about her new Apple computer, and she got a map and showed me some good places to visit in Rio. I was assured by another cop that in the end "we'll get them." Since I knew the corrupted nature of these particular airport machines was known at least a year earlier, I was not so confident. I had to wonder if on some level a kick-back was keeping these machines in operation. You get the sense in Brazil that crime is not aggressively attacked as much as it is managed. That is, make sure the right people benefit. But maybe that's how it is everywhere and its just more obvious in Brazil, a place where people tend to live more boisterously than elsewhere. The rich get richer and the poor get poorer, and the military and police are used to keep it all from boiling over. The extremely popular Brazilian films Elite Squad One and Elite Squad Two are interesting to consider. By the end of the second film, elements of the police militarized right that had been focused on clearing out drug gangs in the favelas have joined forces with elements of the left against what the filmmakers conclude is the true enemy in Brazilian society -- corruption.